I've read nearlý all Sarah's books, except Affinity, and really liked her as a writer. The complexity of relationships, good plotting and excellent research into historical detail and sense of place. But this particular book seems very one dimensional and although she gets the 1920s to some extent, I am getting a bit bored with this concentration on one relationship. The good point I can see is the way she looms at the role of women and sniggering men. Hasnt really gripped me though it's an easy read. This book intrigued me owing to its period setting but unfortunately, for me, it seemed to come apart at the seams in this regard. The setting, with regards to technology, description of the environment and lifestyle all fitted the period well. However, the human element felt a few decades further on. The main character particularly felt too modern, her voice and attitudes felt more like a women of a period a few decades later. While she is meant to be modern for her age, I just feel this was taken too far and stretched beyond what even a modern woman of that period would have been. The characters and the environment just seemed at loggerheads with each other and failed to fuse into one single coherent element, which resulted in a jarring feel throughout. I was disappointed that more wasn’t made of the association with the suffragettes, this would have been a great aspect to explore and would have given a greater understanding of the main character’s past and personality. I also feel that the main character lacked emotion with regards to her brothers lost in the war. I feel that a person in that situation who has been robbed of two members of her family and left with no income would be angry either at the government in whose service they had died and yet have clearly just left any dependants in poverty or anger at the those who had initiated the war. While she clearly showed regret in their passing, the emotions felt muted in the terms of what a person would feel should war rob them of relatives and their livelihood in one strike. I found the start of the novel unnecessarily slow and didn’t really find it that absorbing. If not for the fact I had agreed to read it as part of the book club I would not have read past page 30. I agree with Katie about the incongruity, I love the introduction because it sets a scene, paints a picture, outside privvi, but should there also be an inside loo? Terms of setting the scene, thought the layout would be fundamental, mega meaning to the plot but it doesn't. Loved the historical she seemed more a woman of the 50s - Brighton Rock, it reminded me of that. Interesting bit with Frances as a sufferagette, could have made more of that. When the relationship developed, it was tedious, it lacked passion, excitement, I didn't believe in the characters. Having finished the book, Fingersmith was full of twists and turns, this one I was just relieved to finish. Redeemed itself, with the court scene, the little vignette, and I liked Lillian's family. But essentialy, didn't find realistic the two main characters feelings about what had happened. Not suffient twists and turns. This is the first Sarah Waters novel that I've read. I enjoyed being taken back in time and had no problem with the intensity of the relationship. I found the descriptions of paying guests arriving and living in the house and all that brings with it, like the loss of privacy very lifelike. It is almost as if Waters takes the traditional Lady and Servant roles and turns them up-side down. Lillian is the more bohemian, Frances scrubs floors without shame. I didn't enjoy the suspense of the murder trial, though I enjoyed the plot (if that makes sense). I did feel the author rather let the reader down by the ending, I really wanted to know what would have happened had the outcome been different. This could possibly have been a book for which there were two endings. Is the novel is about a lesbian relationship goes wrong or a crime of passion? London in 1922 seems to be an intriguing setting; high unemployment and shortages of supply. And yet, does it justify the circumstances in which Frances Gray and Lilian Barber meet? My knowledge about 1920’s is limited, for little do I know the significance of the period towards their blooming relationship; of course apart from the fact that women lovers is a taboo, albeit not illegal like homosexuals. And therefore what happens between them can occur in any period of time, although the humiliation and the discrimination they’d have gone through had they been found out would be much greater than a century later. Towards the end I realise the more I know about Frances and Lilian the more the contrast shown in their behaviour in Part I compared to Part III. As I finish the last paragraph I still cannot make up my mind who Lilian and Frances actually are. In conclusion, the novel appeals little to me with its attempt to surpass crime/romance/gender role genre at the same time. The Prize has published The Brilliant Woman’s Guide To A Very Modern Book Club to help you make the most of your book club and celebrate all the ways that novels can bring people together. With features from brilliant women writers including Kate Mosse, Grace Dent, Joanna Trollope and Helen Dunmore, and reading notes to the 2015 Baileys Prize shortlisted books this guide is for anyone who loves a good book. You can download it here free. Which is your favourite book on the shortlist for the Baileys Women’s Prize for Fiction 2015? The poll closes on 1 June and the reading group winner will be announced here and on social media. Please vote. Join in with the conversation on Twitter with #ThisBookClub and #3WordReview of your favourite book written by a woman. between for DC Comics’ adult imprint Vertigo, which was turned into the TV series Constantine this year. We first interviewed Mike in 2003 but we have also chatted to him while he was writing his book series Felix Castor, The Unwritten and Lucifer. We even got Mike along to celebrate Tripwire’s 21st anniversary at an event that took place in Foyles in May 2013 and editor-in-chief Joel Meadows shared a stage with him at one of the Big Green Bookshop’s bookswap events in April of 2014. 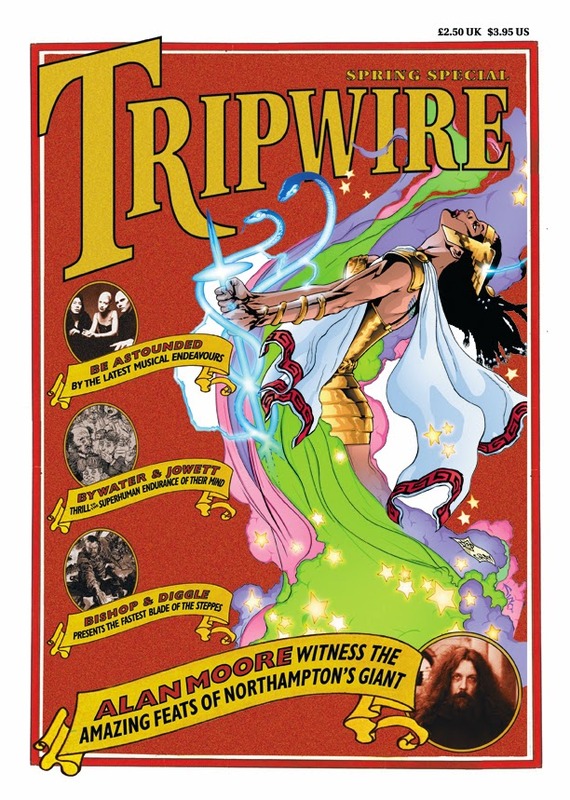 Tripwire has existed as a magazine since 1992, covering comics, film, TV and related media with a particular focus on British creators. We have watched Mike Carey grow from a raw talent to the accomplished writer he is today. We have always tried to support and promote his work in Tripwire, which is now a website with the same remit as the magazine: covering comics, film and related media with a focus on a more intelligent and irreverent approach to the material." TRIPWIRE MAGAZINE is the magazine of genre culture, examining comics, film, music and so much more. It was created by Joel Meadows, as an incidental fanzine and evolved into an comprehensive window into the things people love and consume. 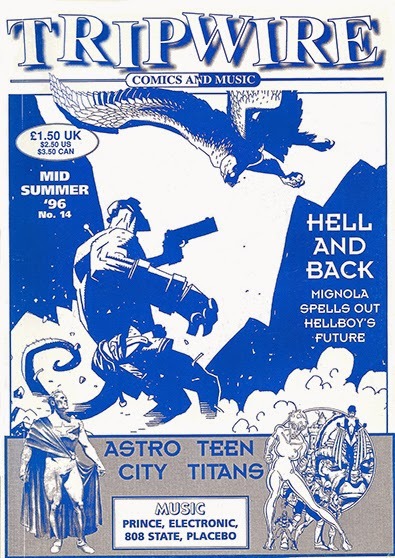 TRIPWIRE published over fifty issues of the magazine that covered comics, film, TV, novels and related media. Tripwire interviewed everyone from Stan Lee to Mike Mignola, Alan Moore to Joss Whedon. In 2013 they decided to wrap up the physical publishing programme and switch to online/ digital. Joel will be attending the Mike Carey The Girl with all the Gifts event as FLF photographer/journalist. Mike Carey has worked extensively in the field of comic books, completing long and critically acclaimed runs on Lucifer, Hellblazer and X-Men. His ongoing comic book series for DC Vertigo, The Unwritten, has featured repeatedly in the New York Times’ graphic novel bestseller list. His superhero series Suicide Risk, published by BOOM! Studios, has been nominated for two Harvey awards. He is also the writer of the Felix Castor novels, and (along with his wife Linda and their daughter Louise) of two fantasy novels, The City Of Silk and Steel and The House Of War and Witness, published in the UK by Victor Gollancz. He writes mainstream thrillers as Adam Blake, and as M.R.Carey is the author of the bestselling novel The Girl With All the Gifts.